The brown area outlined is the Cuddy Valley project area, where trees will be thinned for forest health in the face of drought and beetle infestation. The Cuddy Valley lies in the shadow of Mt. Pinos, off Interstate 5 between Lake of the Woods and Pine Mountain Club, encircled by the wooded slopes of the northern edge of Los Padres National Forest in Kern County. As in the rest of the drought-weary western states, the pines in the area are dying, riddled with a pest called an “ips,” attracted by the trees’ weakened state from fewer drops of rain, as well as a parasite known as “dwarf mistletoe.” But the woods are super-abundant, a crowded condition that forest managers attribute to past fire suppression, now adding to current fire dangers. Thinning 1,200 acres in a jagged strip around one of the mountain communities was approved by the forest supervisor in November, and the planned tree and underbrush removal could be instructive for the foothill communities that lie 50 miles to Cuddy Valley’s south in Santa Barbara County. Brown, dead, and dying trees in Los Padres are suffering a host of problems, among them the pinyon ips (Ips confusus) and the California fivespined ips (Ips paraconfusus), or engraver beetle. 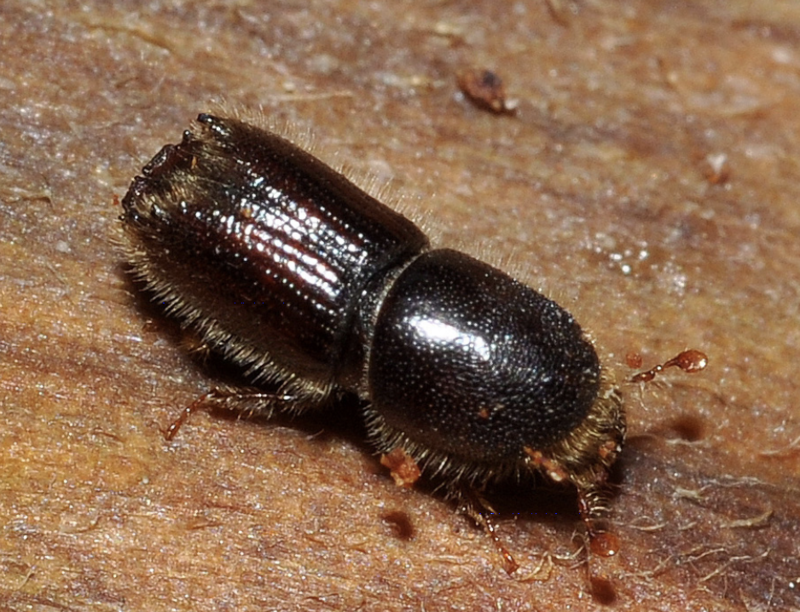 Normally found in fallen tree trunks, the beetles have been aided by the drought in etching galleries of eggs and larvae into the underside of the bark of living trees, also introducing a fungus that helps the burrowing bugs kill the pines. The lack of water that has made the trees susceptible to the beetles is worsened by too many trees inhabiting too small a space. The project report describes a recent count of 480 trees per acre in a forest that had 93 trees per acre about three decades ago. Greg Thompson, a forester and the project leader for Los Padres, described the overcrowding as a milkshake with too many straws dipped into it: “One straw works fine. Two straws, you can still share. But if you put a hundred straws in there, you see the problem. These trees aren’t getting enough water.” In fact, he said, in places where trees have been thinned, creeks that had dried up were seen to run again. 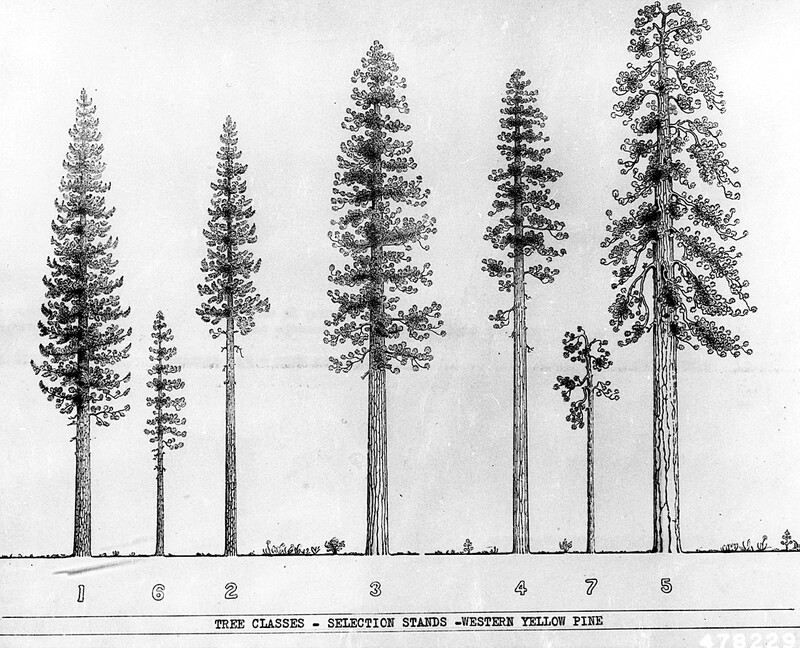 The surveys done for the project identified Jeffrey pine, ponderosa pine, and the relatively rare black oak as the largest and more fire-resistant of the trees in the territory historically, though they needed more sunlight and young saplings are being crowded out by white pine and sagebrush and woody debris. Once funding is secured — costs would be by the hour for crews and equipment — Thompson’s hot shots should begin cutting their way into the forest by next fall, identifying the desirable trees to keep, and thinning as they go through the project area. When the larger, taller trees grow farther from each other, there’s less chance of crown fires, which create flame lengths that are too dangerous for ground crews to be nearby. The result is a “shaded” fuelbreak. About 791 acres in the project are mixed conifer and pinyon-juniper stands, and about 409 acres are sagebrush-scrub. The natural fire return in the latter is reported to be 35-100 years, but because of the project area’s proximity to homes and human traffic, the Cuddy Valley has had 15 fire-starts since 1998, most held to 10 acres or less, but four exceeding 1,000 acres in size. Heavy equipment wielding a masticator that’s held about a foot above ground would give the brush a “haircut,” as Thompson called it, growing back usually within two or three years with sufficient rainfall. Some of the debris is mulched or chipped onsite, logs are removed with a log truck, and if the quantity is too great and poses a fire danger itself, the debris is burned when the air quality permits it. Similar methods were employed in refreshing the fuelbreak along Santa Barbara’s Camino Cielo Road in 2016, Thompson said. Another in Kern County is being organized for Tecuya Ridge, to the north of Cuddy Valley. The fall 2019 start date gives them enough time to do owl surveys, Thompson said, to identify where nests are and where logs and snags should be left for burrows and perches. The question of how to deal with California’s millions of dead trees is being partly answered by this project, which has the end goal of increasing the health of the forest that populates Los Padres. In so doing, it should also increase fire protection to the nearby communities and small ranches in the WUI, or wildland-urban interface. Editor’s Note: After this story published, members of Los Padres ForestWatch contacted the Independent to state that the John Muir Project had reviewed the Forest Service’s Cuddy Valley tree survey data. The 1995 survey was of five species of trees four inches or more in diameter; the more recent survey counted all trunks of all species that had sprouted since then. The Muir Project review concluded that only 83 trees per acre of 1995’s five species were now in the project site. As well, ForestWatch objected to the sale of logs from the fuelbreak and expressed concern over the lack of an environmental assessment of condor roosting sites or a sensitive plant called the Tehachapi monardella. The group is also concerned about the proposed Tecuya Ridge project’s impingement on condor territory, its size, and its distance from housing.